NEW YORK – Combining artistry with engineering, automata are mechanical marvels. These mechanical figures move via clockwork mechanisms, allowing them to move their hands, walk, dance and even smoke but they also embody equal parts of fancy and magic, becoming a sort of animated sculpture. 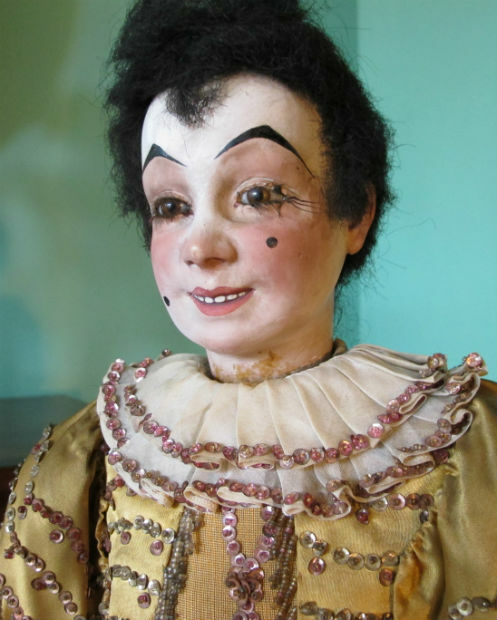 Many of the best automata were made by Gustave and Henry Vichy and other makers in Paris, including Leopold Lambert, who was a foreman at Maison Vichy before launching his own business, Roullet et Descamps, and the Bontems family, known for lifelike singing birds and singing bird boxes. 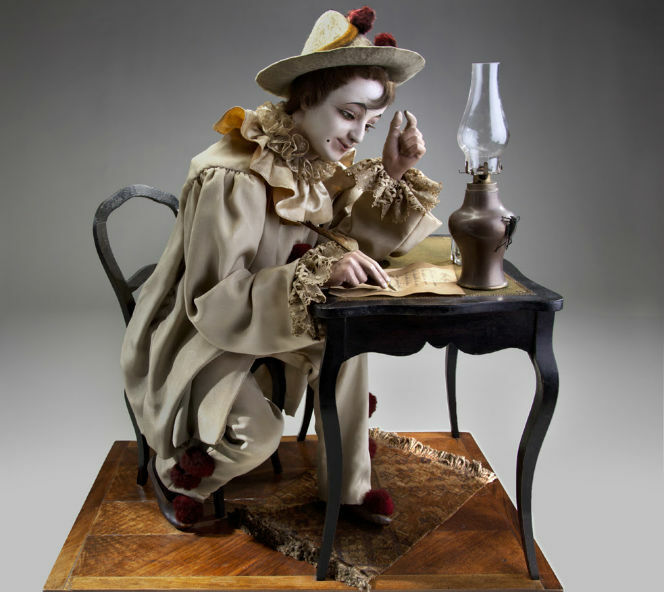 Auction Team Breker in Cologne, Germany, which specializes in mechanical antiques, including automata, explained that automata date back to antiquity with mechanically articulated figures powered by air or water. The golden age of automata, employing complex mechanisms, spanned the mid-19th century until the outbreak of World War I in 1914 and was centered in Paris. “During this heyday period, Paris was the epicenter for classic French-style automata with the major makers being Alexandre Theroud, Jean Roullet, Gustave Vichy, Leopold Lambert, Bontems, Phalibois, Roullet et Decamps and Triboulet & Renou,” says Jeremie Ryder, the Murtogh D. Guinness Collection conservator, Morris Museum in Morristown, N.J. 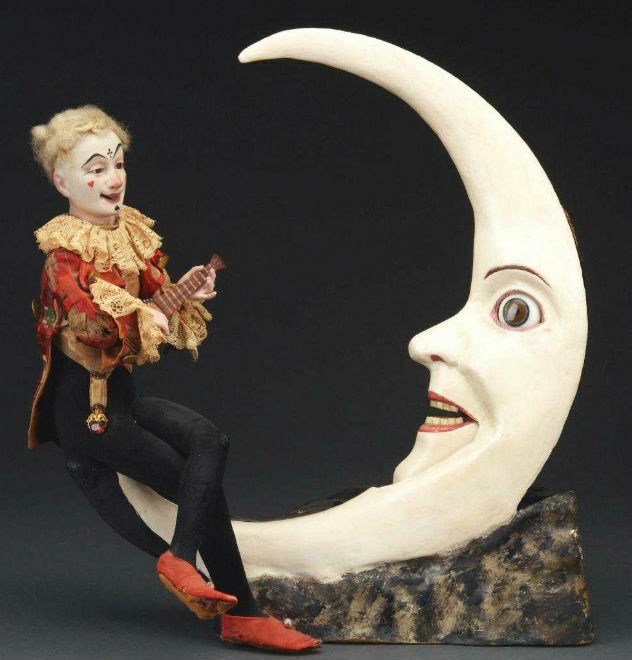 The museum received in 2003 the Guiness collection comprising 750 historic mechanical musical instruments and automata. Rarity, subject matter and condition are among the driving forces in determining how valuable an antique automaton is but its personality ranks high also. “The pieces that bring the big prices at auction tend to be those with a distinct character or facial expression and a dramatic or surprising element – acrobats, entertainers, smokers and the surreal,” according to Auction Team Breker. 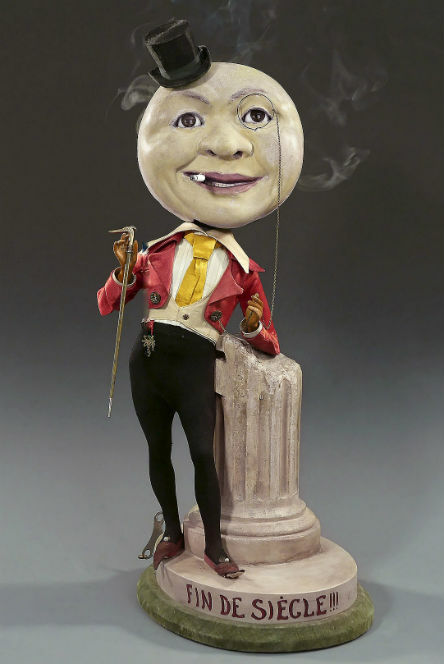 A fitting example is the “Fin de Siècle” smoking moon automaton by Gustave & Henry Vichy that auctioned here in November 2015 for $123,879 or such charming pieces as a grand magician standing at a table performing tricks with objects under cups or an acrobat performing a handstand atop a ladder. Detail image of an acrobat automaton that performs a handstand on two chairs, by Gustave Vichy, Paris, circa 1890, papier-mache and clockwork. Image courtesy of The House of Automata. Advanced private collectors and museums gravitate toward pieces that retain their “historic integrity,” meaning as original as possible, all things considered, Ryder says. Owing to the mechanical nature of automata, conservation must be undertaken with care to preserve a piece’s functionality. 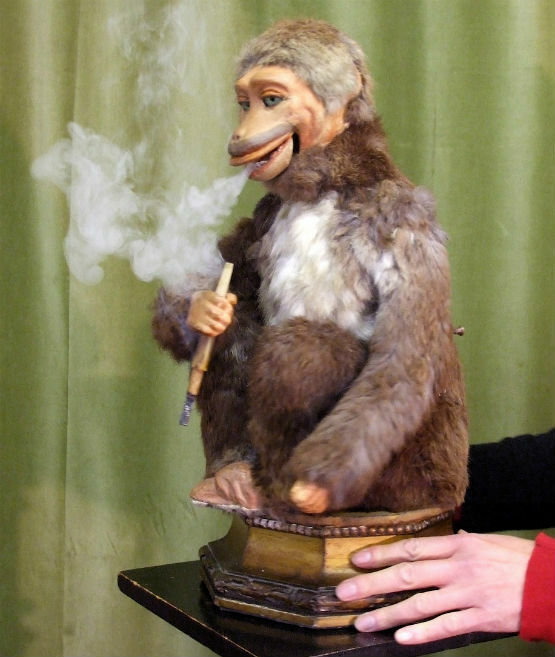 Smoking Monkey by Roullet & Decamps, Paris, circa 1900; fur covered papier-mache and clockwork automaton with bellows. The automaton smokes real cigarettes. Image courtesy of The House of Automata. 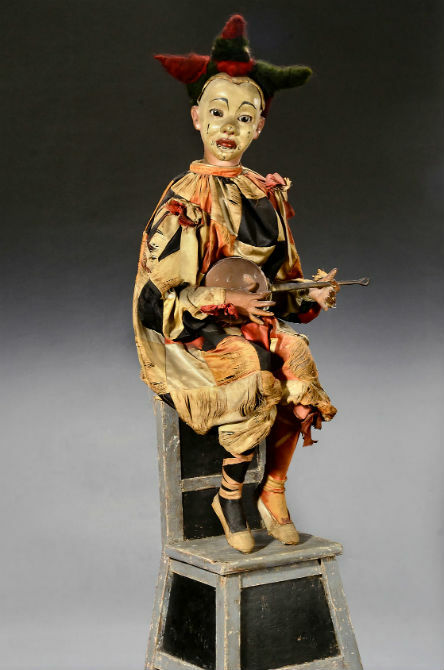 This eccentric clown musical automaton by Gustave & Henry brought $42,795 in November 2016 at Auction Team Breker. 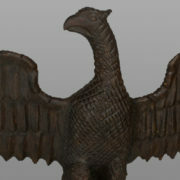 Image courtesy of Auction Team Breker and LiveAuctioneers. ‘Buffet Magique’ (The Magic Cupboard), probably made by Auguste Triboulet for Maison Vichy, Paris, France, circa 1910. Video courtesy of Morris Museum, the Murtogh D. Guinness Collection. 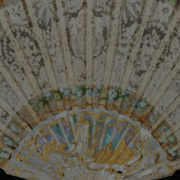 NEW YORK – Hand fans began as a strictly utilitarian item, to keep its owner, usually ladies, cool on a hot day. Picture Cleopatra reclining on a sofa while a servant fanned her with a large fan. Somewhere along the way, fans got smaller so they could travel in a bag and became quite decorative. 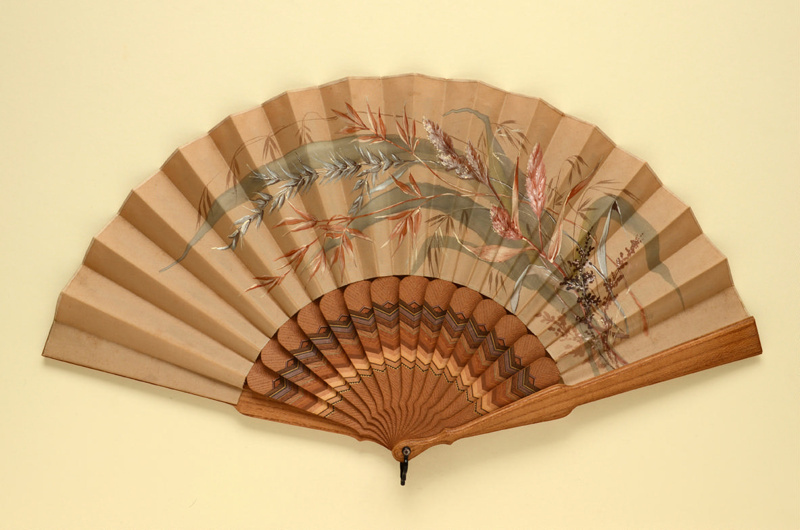 Many types of hand fans are collectible today, including both folding fans as well as fixed fans that don’t fold. Some collectors are eclectic, collecting a variety of fan styles but many specialize in one type, such as those advertising a product or made of bone or lace or featuring a certain decoration theme. “People sometimes want to collect fans from different countries or that are defined by their time period,” says Abbey Block Cash, president of the Fan Association of North America. 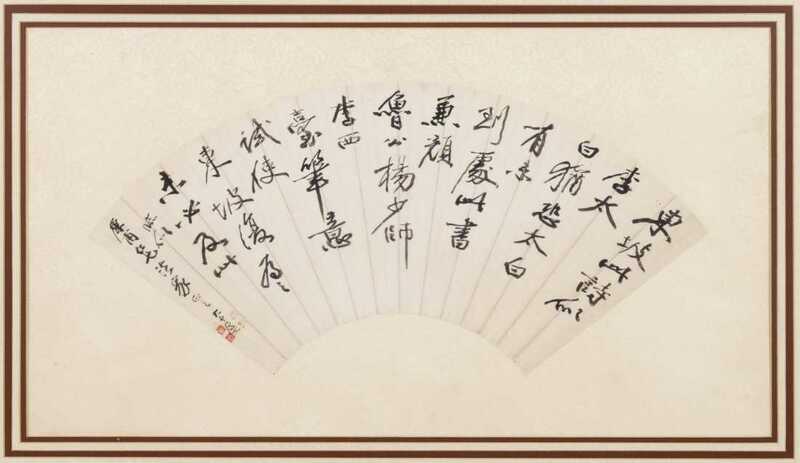 “Fans are also desirable based on their materials; the sticks may be constructed of lacquer, carved ivory, resin, tortoise, bone, wood, silver, gold, metal, or mother of pearl. The fan leaf may be of silk, cotton, satin, lace, decoupe or feathers. Mary Cooper, a longtime dealer in antique costume/textiles and publicity officer for the Fan Circle International, began selling vintage dresses while still a student in England about 40 years ago. Her passion for fans began when searching for an antique lace veil to wear for her wedding and finding a lacy fan. She has traded in and collected many lace fans and is personally drawn to Art Deco and Art Nouveau fans, around the same time (early 1900s) that women smoking cigarettes was no longer taboo, bringing about the demise of fans. Holding a cigarette in one hand and a drink in the other, women stopped carrying fans as they didn’t have a spare hand to hold it, she explained. Detailing the history of fans, she said, “If you can imagine trade starting from Asia into Europe, the import agencies brought into Italy and into Marseilles in the south of France. 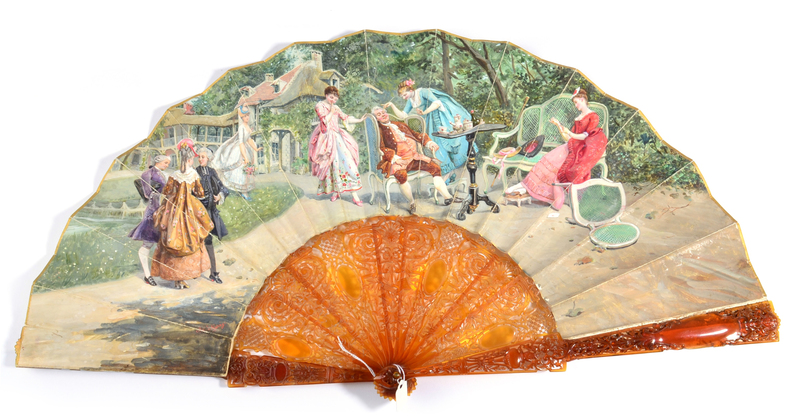 The Italian artists used to paint a leaf, which is what we what we call the paper that sits on top [of the fan].” Fan leafs are often made of paper today but in those days it was lambskin or goatskin, made thin, she explained. “That’s one of the ways we can tell the age of a fan as in what that bit on the top is made of,” she said. 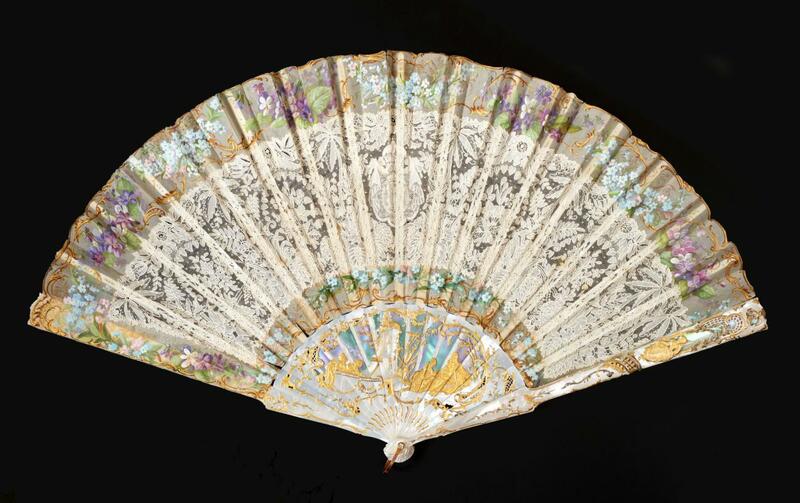 By the 18th century, folding hand fans were made throughout Europe, into England and later in America; crafted of such elegant materials as tortoiseshell, ivory, bone and lace. The decoration on their leaves was ornate and meant to spark conversations among the fashionable ladies carrying them as well as conveying status. 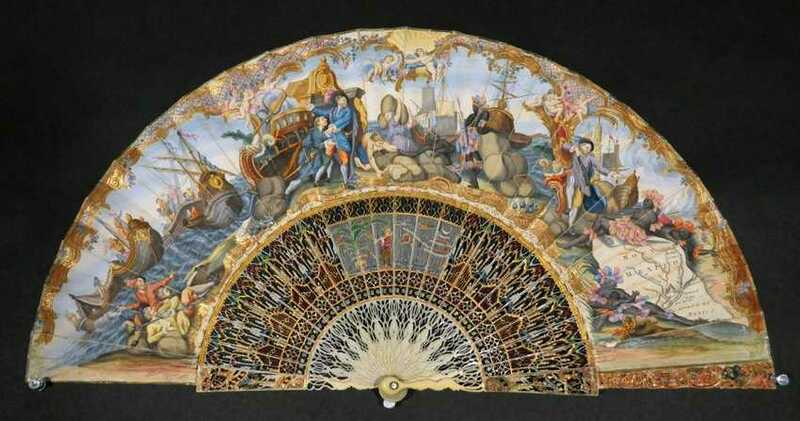 Among the most famous of Europe’s fan makers were Felix Alexandre (b. 1823), who made fans for European royalty, Lachelin and Kees, and last but not least the House of Duvelleroy, founded in 1827 to make fans fashionable again. Interestingly, in 2010 two women pooled their savings to buy the rights to trade as Duvelleroy and are again making fans. Fans from all antique periods are popular but perhaps none more so than circa 1890s-1920s fans “where you have Art Nouveau styling, which was just beautiful design, color and shaping to the fan itself and good artists painting them,” Cooper said, adding that fans from that brief period are few, which pushes up the price. Faberge fans are also rare and highly collectible. “You either want to buy a fan made in small numbers or you want to buy a fan with what we call provenance,” she said. “As a collector, I know I can’t collect one belonging to Queen Elizabeth II because she keeps them, but I can collect from someone who was in high society when fans were popular. We are always looking for fans that belong to somebody, it’s important if we can find them but it is quite a challenge, so you have to content yourself with just high-quality ones.” Conversely, cheaply mass-produced fans were not expected to last, so surviving examples can be rare and desirable. 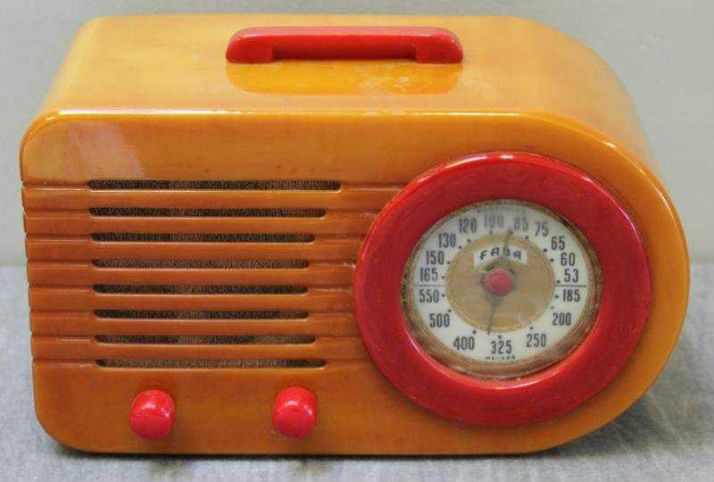 Billed as the “material of a thousand uses,” Bakelite went into commercial production in 1922. An article in the October 1925 issue of the trade publication Plastics magazine claimed the new synthetic phenolic resin could be used for “jewelry, smokers’ articles … sealing electric light bulbs in metal bases … varnishes … electric coils, lacquers … silent gears … and molding material, from which are formed innumerable articles of utility and beauty.” We know that resin today as Bakelite, named after its inventor, Leo Baekeland, the chemist whose process was patented in 1909. The scientific name, though, is polyoxybenzylmethylenglycolanhydride, “a thermosetting phenol formaldehyde resin, formed from a condensation reaction of phenol with formaldehyde,” according to a Wikipedia entry. This revolutionary new type of phenolic resin, or synthetic plastic, was heat resistant, did not conduct electricity, was completely insoluble, totally inflexible and much more economical to produce in large quantities than celluloid, the plastic of the time. It was perfect for molding articles of utility such as insulators, military equipment, automobile parts and the early rotary dial telephone. 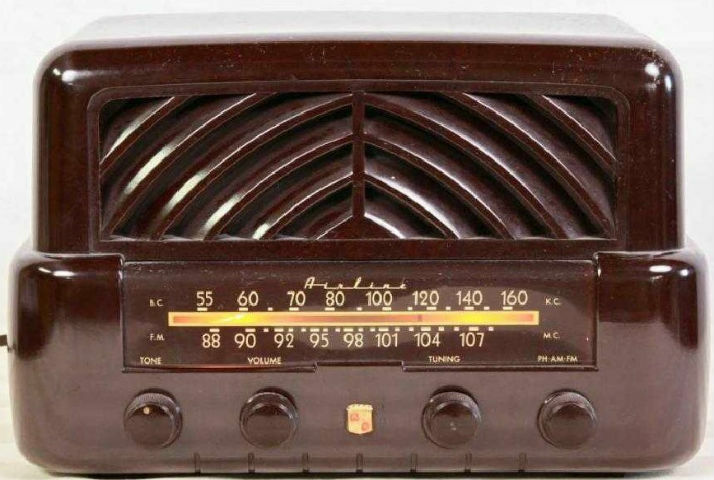 The first tabletop radio, though, was one of the first items that was both an article of utility and of beauty when introduced in dark brown, black and dark marbled Bakelite. While not exactly a decorator choice, the darker colors concealed the use of cotton, paper, glass fabrics, nylon, canvas, linen, sawdust, fiber and even asbestos to strengthen an otherwise brittle compound. But, if darker tones represented early Bakelite, how is it jewelry and other items made of lighter, mostly primary colors are commonly sold as Bakelite? Because those items are made of Catalin. Known as a cast phenol formaldehyde resin, Catalin, created in 1927, is a thermosetting polymer not unlike Bakelite, except the production is in two stages, where Bakelite requires more of a multistage curing process. More importantly, Catalin was transparent allowing the use of color or mixture of colors during the manufacturing process. Jewelry, bangles, beads, brooches, tableware and other useful household items are made of Catalin, although it is usually identified as Bakelite to collectors. There are key differences in Bakelite and Catalin. As was mentioned, Bakelite is manufactured with fillers and produced in darker colors to disguise the fillers making the item more stable over time. Bakelite also has a heavier feel. On the other hand, Catalin, because of its shorter manufacturing process is lighter but less stable and eventually will crack or craze. Early colorful radios from FADA and Emerson made from Catalin, for example, tend to warp, while the colors tend to darken over time with white turning to yellow. Bracelets in vibrant green, yellow, red or combined shades laminated together for a more colorful style are the most desired in their original shade, with figurals in the shape of plants, animals and flowers easily the most sought after by collectors. Collectors will occasionally find other early plastic-like material advertised at auction. Some were experimental before Bakelite or Catalin and others just had small production runs. They are no longer being manufactured, but turn up as collectibles. Celluloid is considered the first true thermoplastic when it was marketed as Parkesine in 1856 and Xylonite in 1869. It is made from a compound of nitrocellulose and camphor which is quite flammable. The covering over early political buttons, billiard balls, film stock until 1950, and vintage ivory-like handles were made with celluloid. Pingpong balls and some guitar picks are still made from celluloid today. By 1880 Crystalate, invented by George Henry Burt, from nitrocellulose, camphor and alcohol, was based on an earlier form of plastic known as bonzoline. Crystalate was used mostly for gramaphone records and billiard balls and has long since been discontinued. Faturan, possibly named for chemist Esmaeel Almail Faturan in the early 19th century originally mixed natural resins to form worry beads (komboloi) and counting beads (misbaha). A synthetic version made by Traun & Son, a German company, was made from early 20th century to the 1940s. Original Faturan, though, eventually oxides to a dark red no matter the original color and is rare as a collectible. Galalith is a late 19th century plastic that utilized casein (found in milk) and formaldehyde to form a milky white hard plastic, but once set it could not be molded. By World War II, production was dramatically reduced to save milk for civilian use. Fashion designer Coco Chanel utilized galalith as costume jewelry and is still being produced mostly as buttons. Galalith emits a milky smell when rubbed. Micarta is a phenolic resin like the others, but was used as a laminate over linen, canvas, paper, fiberglass and carbon fiber. Developed by George Westinghouse by 1910, it was used to make knife handles, handgun grips, pool cues, hardhats and early fan blades. Micarta is usually dark in color. Virtually all of these early plastics have been either discontinued or have limited industrial use since the 1950s due to its labor-intensive mold and casting process. Yet, auction results seem to treat these early plastics similarly when it comes to collector value, except Faturan which has become more of a museum piece due to its rarity. There are contemporary plastics that resemble Bakelite, so-called “Fakelites” that are treated differently. These fakes have similar design and production methods as Bakelite and are hard to spot except on close examination. 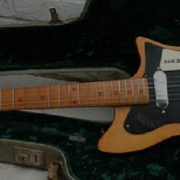 Veteran collectors know the uniquely identifiable “clunk” sound that two pieces of vintage Bakelite make when tapped together. Bakelite also feels heavier. Collectors sometimes use the hot water method to test for authentic Bakelite (dip in hot water, rub and test for the smell of formaldehyde) or the 409 method (just a touch of Formula 409 cleaner or Simichrome brand polish on a cotton swab on a hidden area and the swab should turn yellow; rinse the item immediately). You can just dry rub it as well and smell the telltale formaldehyde (works best with dark Bakelite). Vintage Bakelite may also have been reworked, recut or redesigned without being marked as such. It doesn’t necessarily mean it is a fake or even a reproduction and its auction value isn’t compromised, but it may be judged differently from its original use. Just be warned that reworking Bakelite yourself produces the harmful effects from the phenol and formaldehyde used in its manufacture. As it turns out, whether wearing Catalin bangles from Coco Chanel or listening to big bands on an Emerson Bakelite radio, whatever you call it, they’re equally collectible. 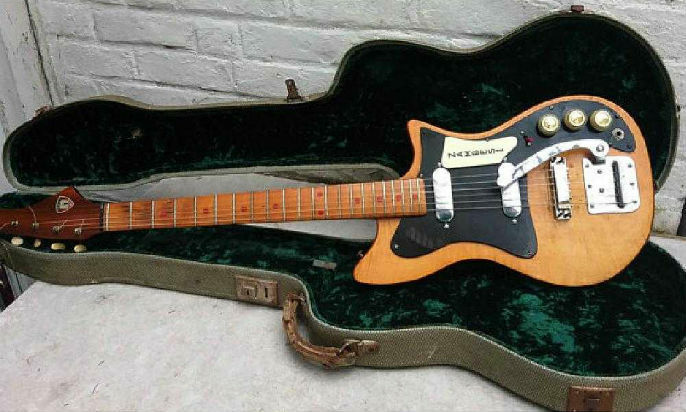 Whether you play gypsy jazz, blues or garage band rock ’n’ roll, the Jasper52 online auction of vintage guitars on Wednesday, Feb. 20, likely has an instrument to amp your interest. Acoustic Spanish, Romantic and concert guitars are joined by a chorus of more than a dozen electric guitars. A 1920s banjo and a three-quarter-size French violin are included for good measure. There’s a category of collectibles that probably didn’t even exist 10 years ago but which is so popular today that entire auctions are exclusively dedicated to it. They’re called “mantiques” – items that manly men and the women who love them use to decorate their basement, garage or den—the man cave. Mantiques can take on many forms. 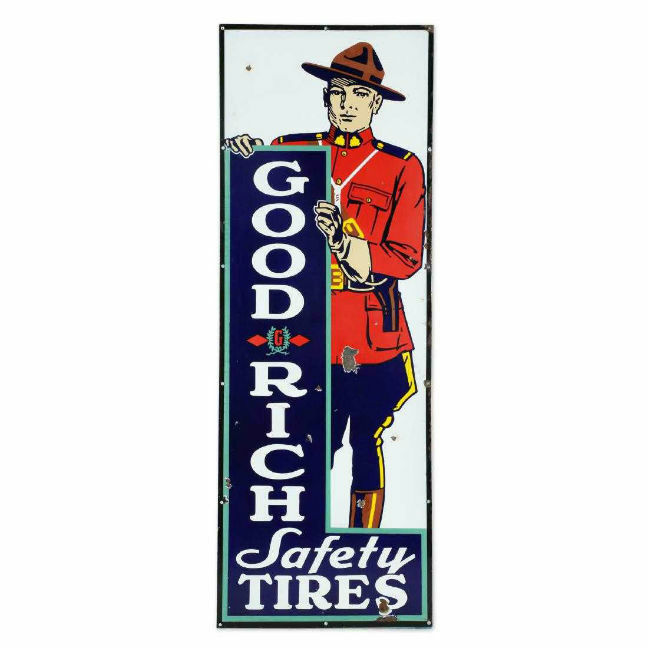 Some of the more common mantiques include old gas station signs, anything coin-op (slot machines, Coke machines, trade stimulators, jukeboxes, pinball machines, vending machines), beer trays, barber shop memorabilia and even old cars. 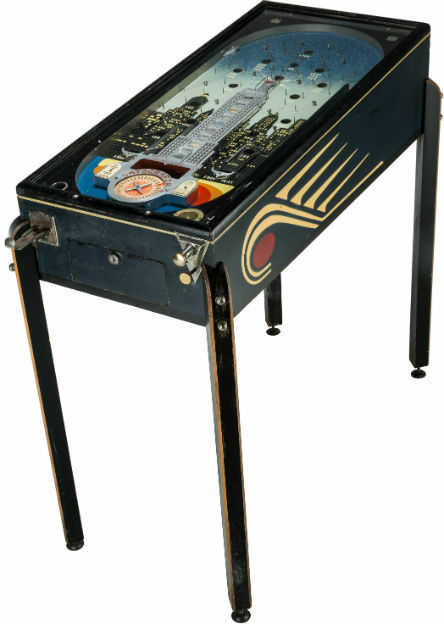 “Collecting mantiques may start as picking up a novelty here or there, but it can quickly explode into filling a den or garage with amazing finds,” said Eric Bradley, Heritage Auctions’ Director of Public Relations. “Each collection is different, and there’s no limit to how these disparate collections come together. Once assembled, the objects harmonize to do one thing: tell a story about the collector and their intellect, sense of humor and proclivities.” Bradley knows whereof he speaks. He literally wrote the book on the subject: Mantiques: A Manly Guide to Cool Stuff. Recently, Miller & Miller Auctions in Canada held an auction titled “Mantiques! Gentlemen’s Collectibles.” “I’ve never seen such anticipation for an auction,” said Justin Miller, of Miller & Miller Auctions. “The energy in the room from the beginning of the sale was unmistakable. Many items were fresh to the market, unlocked from 30- and 40-year collections. The prices tell the story. Collectors were fighting to get what they wanted.” Canadian auction records were shattered, and the top lot was a 1950 Plymouth woody station wagon (CA$35,400). Today, gentlemen’s objets de vertu are in great demand, and that demand is only growing stronger. The category has expanded, to include items ranging from vintage watches and cameras to tufted-leather and quarter-sawn oak furniture. Women have even muscled their sway into the conversation, searching for items to outfit their “she-shacks” —items of a softer tone for their personal home space, such as quilts, textiles and kitchen collectibles. 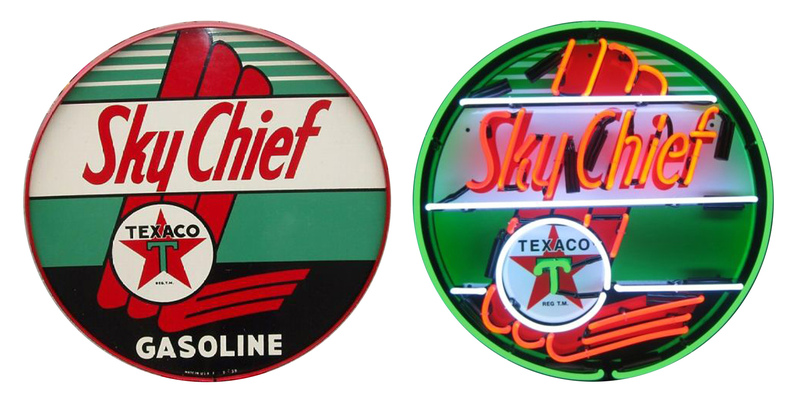 For the guys, some things have been, and will always be, popular, like gas station signs and beer trays. Sports, of course, can be a huge component of a man cave. The website for Steiner Sports has a toolbar category titled “Man Cave Essentials.” Items for sale include an aluminum sign that reads “NOTICE – Bleachers Are Now Alcohol Free” ($59.99); a Giancarlo Stanton 8-by-10-inch plaque with game-used Yankee Stadium dirt ($24.99); an Oklahoma City Thunder subway sign wall-art photo, framed ($59.99); and a Sacramento Kings “Home Sweet Home” sign ($59.99). Those signs are replicas, which explains the low prices. To own or display a baseball or football signed by a marquee player or group of players understandably will cost much more. One’s budget can be an important factor when outfitting a man cave. 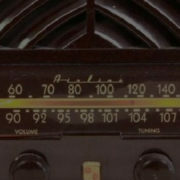 A restored 1950s-era Wurlitzer bubbler jukebox, for example, will set you back thousands, but a man on a budget might be just as happy with an old Bakelite AM radio and reproduction rock ’n’ roll poster from the same era. The effect is the same: to recreate a feel for a carefree time and place long past. The costliest man cave items, not surprisingly, are vintage cars and motorcycles. But even the big-name car auction houses like RM Auction and Barrett Jackson now incorporate petroliana and automobilia collectibles into their sales as ancillary offerings, and have even held stand-alone sales for just those items—no cars at all. Morphy’s also conducts highly successful auctions of petroliana and automobilia. Vintage motorcycles hold particular appeal to men, plus they take up far less space than a car. Prices are robust, too. At auction recently in Texas, a 1951 Indian Blackhawk Chief in beautiful condition roared away for just over $12,000. Man caves are nothing new. They date back to the days of the Industrial Revolution, when the home was often divided into spheres defined by gender. For men, who were all about politics, business and the law, that meant a place where they could let it all hang out, without fear of offending the womenfolk. The ladies tended to the rest of the house and were in charge of maintaining a strong moral fiber within the family. 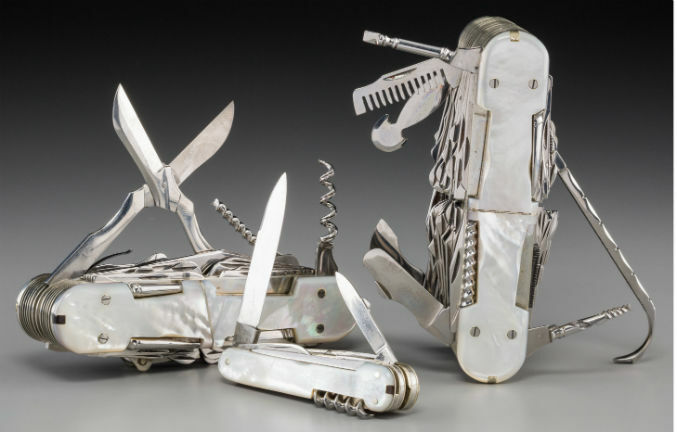 Over time, men expanded their reach into the mantiques realm, adding things like woodworking tools, vintage firearms and edged weapons, and such. Much later, with the debut of TV shows like Pawn Stars (2009) and American Pickers (2010), interest in the idea of “antiques for men” (or “mantiques”) enjoyed a sharp spike. Men everywhere got the itch to get out there, climb through some old barns, get their hands dirty and bring home a rusty Texaco sign. Suddenly, antiques shopping was less intimidating to the average Joe. With the midterms looming and politics on everyone’s mind, no wonder collectors of political campaign buttons and pinbacks are in their glory, chasing up and adding new selections to what they already have. A report appearing two years ago in LiveAuctioneers’ digital newspaper Auction Central News identified campaign buttons as the most popular type of political memorabilia, followed by textiles, flags and posters. But why pinbacks and buttons? After all, they’re smaller and visually less impactful. 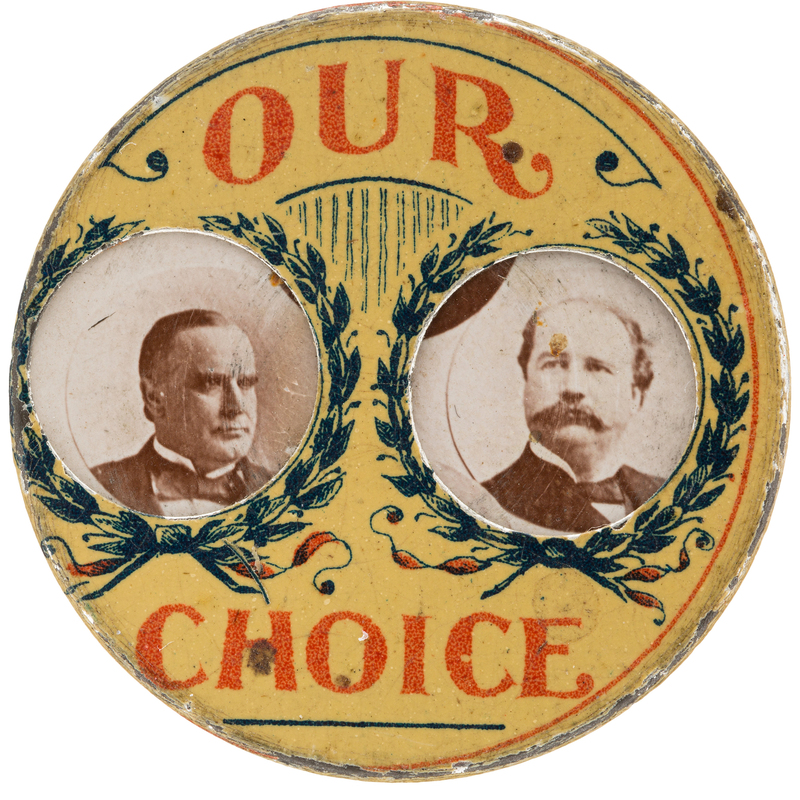 Indeed, nice examples from the 1896 presidential campaigns of William McKinley and William Jennings Bryan (spoiler alert: McKinley won) can be bought for as little as ten or fifteen dollars – and in nice condition! There’s a reason for that: 1896 was the first year that pinback buttons, patented only three years earlier, were mass-produced by the millions, at little cost. 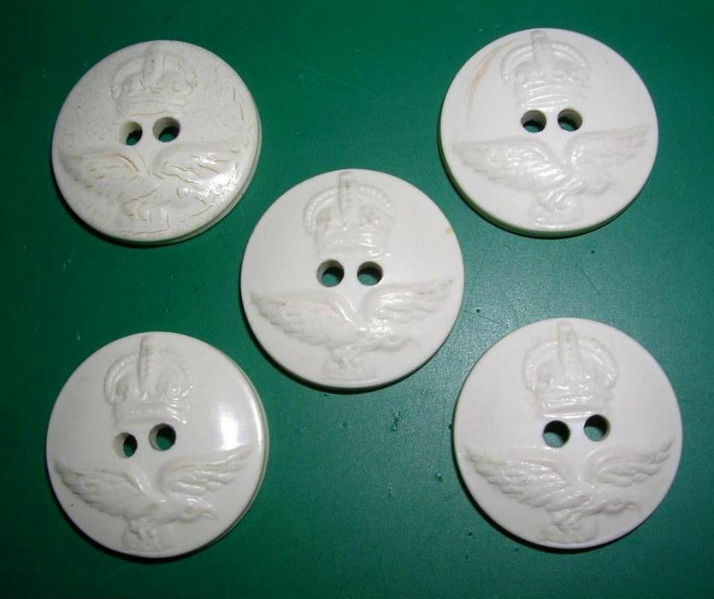 Prior to that, the buttons were mostly just that – buttons, which had to be sewn onto a person’s garment. This McKinley & Hobart “Our Choice” mechanical jugate stud example, over 100 years old, sold for a very reasonable $112.50 at Heritage Auctions on Aug. 26, 2018. To be clear, a pinback button is one that can be temporarily fastened to the surface of a garment using its attached safety pin. The fastening mechanism is anchored to the back side of the button-shaped metal disc, either flat or concave, leaving an area on the front of the button to carry an image or printed message. Such was the invention patented by Benjamin S. Whitehead in 1893. Political campaign buttons have been around in this country literally since the election of President George Washington. At his inauguration, metal pins bearing the phrase, “Long Live the President” were worn by supporters. The phrase was probably chosen as a riff on “God Save the King!,” which the newly independent Americans had been accustomed to cheering back home in Mother England. That pin today, by the way, easily fetches in the thousands of dollars. Think about it – what other type of collectible, outside of maybe rocks and bottles, can be picked up for free? That’s a trick question. Yes, you can gather pins and buttons at rallies, speeches and a campaign headquarters for free, but there will be a cost when buying at auction, on eBay or at an antiques shop or flea market. The spread is a wide one, as certain “Holy Grail” buttons fetch tens of thousands of dollars, while a group lot of 50 common pins might bring $20. 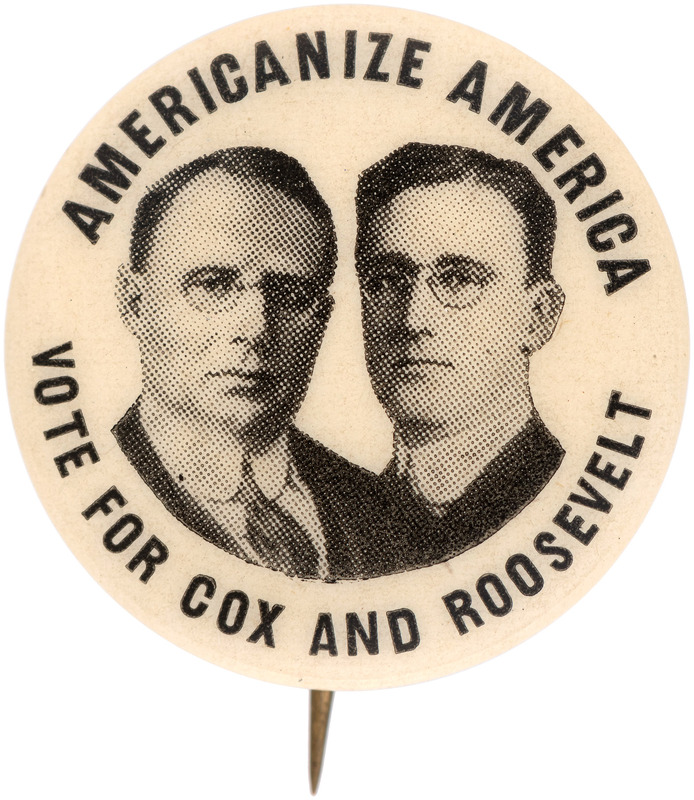 This 1920 campaign button for the Democratic ticket of James Cox-Franklin D. Roosevelt sold for $47,278 at Hake Auctions #222, held November 2017. It was a record for the pinback. Ted Hake was first introduced to pinbacks at age five, when a friend of his mother’s – an antiques enthusiast – gave him a pin that promoted World War I Liberty Bonds. He was instantly enchanted and began collecting more pins, in varying types, not just political. Then, in 1951, his father suggested he start collecting coins, and for a time the pins got put aside. But an encounter at a local coin shop brought Ted right back to collecting buttons and pins. “A friend of the fellow who ran the coin store was a collector of William Jennings Bryan buttons, and he had some on display for sale there,” he recalled. “It cost hardly anything to buy one, so I did and collected political buttons from then on.” Today, Ted is a member in good standing with the American Political Items Collectors (www.apic.us) and was even given the group’s coveted Lifetime Achievement Award. 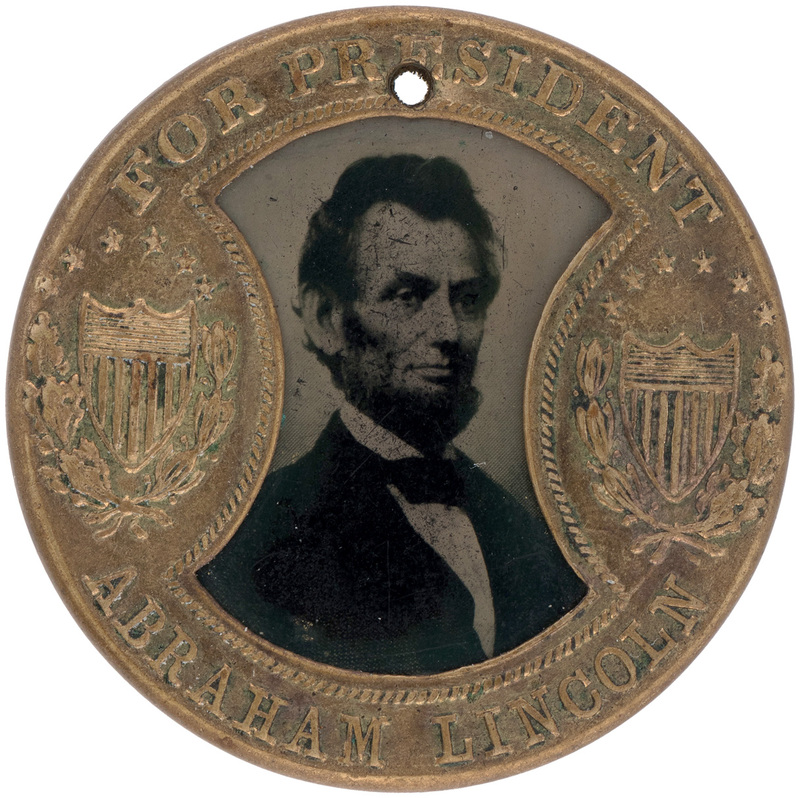 The first political button to show a photographic image was from Abraham Lincoln’s 1860 presidential campaign. Lincoln, as well as his opponents, used the tintype (or ferrotype) process, a photograph made of tin and dark enamel or lacquer. Lincoln’s pins featured Honest Abe’s image on the front and a locking pin on the back – a precursor to the 1896 pinback. This Abraham Lincoln 1864 ferrotype badge (with running mate Andrew Johnson on the reverse) sold for $1,947 at Hake’s #222, held Nov. 2017. Since around 1916, campaign buttons have been produced by lithographing the image directly onto the metal disc. One of the more famous uses of campaign buttons occurred during the 1940 U.S. presidential election, when Wendell Willkie’s campaign mass-produced millions of lithographed slogan buttons in fast response to news items about his opponent President Franklin Roosevelt. It wasn’t until after World War II that collectors found each other and organized the hobby. In the 1950s, Dwight Eisenhower unknowingly fed into Americans’ appetite for the pins when it became a trend to wear an “I Like Ike” button on one’s lapel. Notice no political party is mentioned. That’s because the slogan was coined initially, to encourage Eisenhower (who was still serving as Armed Forces Chief of Staff) to commit to either the Republican or Democratic party, something he had not yet done. It worked, as the slogan helped nudge the war-hero general into the race, on the Republican side. Today, sadly, increasing advertising expenses, plus legal limits on expenditures, have led many American political campaigns to abandon buttons altogether in favor of disposable lapel stickers – which are far less expensive to produce – or even virtual campaign buttons, or “web buttons.” Internet users simply place them on their personal websites. Wide distribution is nearly cost free. 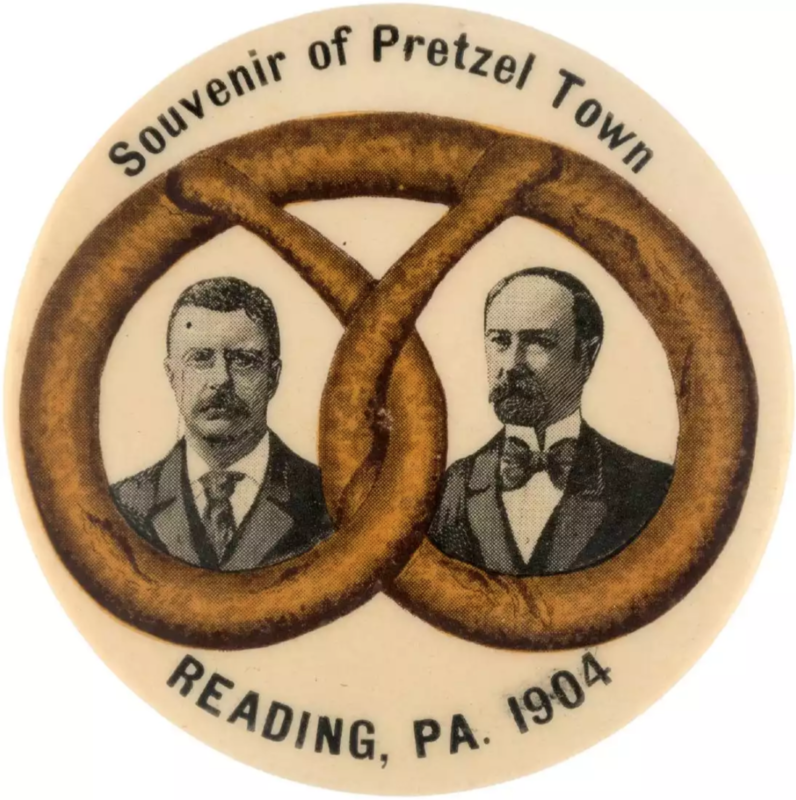 A Roosevelt/Fairbanks 1904 “Souvenir of Pretzel Town – Reading, PA” jugate button sold at Hake’s on May 14, 2018 for $9,675. Image courtesy of Hake’s and LiveAuctioneers. From around 1840 to 1910, life-size cigar store figures of Indian chiefs, braves and princesses – mostly carved from wood but some cast from zinc, too – could be seen inside or outside nearly every tobacco shop in America. The U.S. census from 1860 listed no fewer than 2,269 active wood carvers. Of those, 959 were living in New York, the epicenter of cigar store Indian manufacture. New York City was the unofficial headquarters for studios producing cigar store Indians, or “show figures,” as carvers called them. This cigar store Indian statue sold for $65,000 + buyer’s premium in Material Culture’s May 26, 2013 auction in Philadelphia. It was crafted around 1850 by John Cromwell (1805-1873), who opened his first shop in New York City when he was 26. The most famous and highly collected carvers are Samuel Robb, Thomas V. Brooks, J. W. Fiske, Julius T. Melchers, John Cromwell and William Demuth – although Demuth was not himself a carver but a tobacco products distributor who operated a carving studio. Of the group, all but one (Melchers) worked in New York City. They all even apprenticed under one another at various points in time; that’s how tightly knit the carving community was. 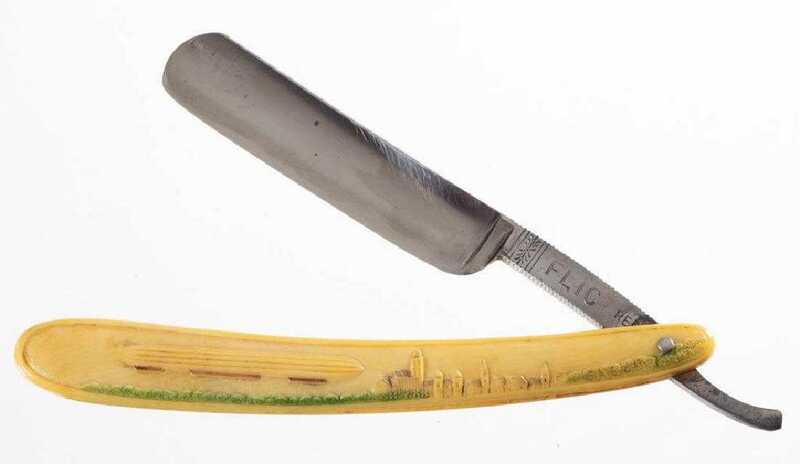 Melchers, the outlier, operated out of Detroit, and was the only carver who was a classically trained artist. The others were more or less folk artists and, in fact, cigar store Indians are generally considered a category of folk art. Melchers, it is said, used actual Native Americans as models in creating his highly detailed, true-to-life creations. In that regard, he’s in the top tier of most desired carvers in the collecting community. 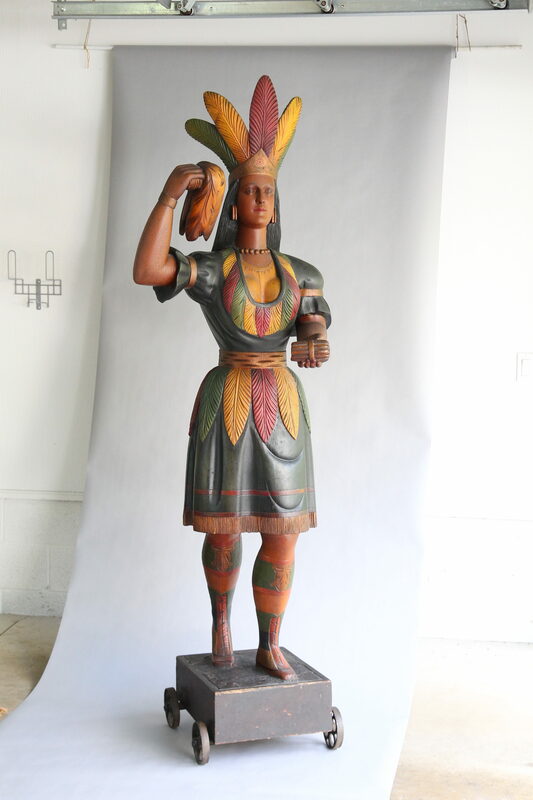 When Heritage Auctions in Dallas, Texas auctioned this cigar store Indian attributed to Samuel Robb in May 2010 for $203,150, it set a new auction record. In May 2010, a carved cigar store Indian done in the manner of Samuel Robb – but not definitively attributed to him, since it was unsigned (most weren’t) – was sold for $203,150 by Heritage Auctions in Dallas. At the time, it was a world record price, owing to the figure’s original paint, superb condition, impeccable provenance and detailed features. 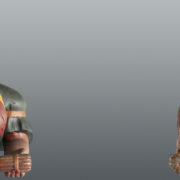 The male chief figure stood 75½ inches tall, including the base. The Heritage record was demolished in 2013 when a female figure – known in the trade as a cigar store princess – sold for a staggering $745,500 (inclusive of 15 percent buyer’s premium) at a sale held by Guyette & Deeter. The Maryland-based firm’s specialty is duck decoys, another genre of carved collectible that routinely sees six-figure prices. The cigar store princess was carved either by Robb or Brooks (again, unsigned) and overall stood 83 inches tall. The current world auction record for a cigar store Indian figure was set by this spectacular example attributed to the shop of Samuel Robb or Thomas V. Brooks (it’s unsigned, so no one knows for sure). It fetched $745,500 at Guyette & Deeter in November 2013. “I had known the owner of the figure for quite a few years,” said Jon Deeter of Guyette & Deeter. “It had been used and never traveled far from downtown Louisville, Kentucky. Its condition was pristine and it was a very attractive princess. We’ve sold other Indians in the mid-five-figure range. They’re fun to work with and are a wonderful slice of American folk art.” The sale price still stands as a record today, although it will doubtless be shattered at some point in the future. Not all cigar store Indians sell for six figures. This carved and painted Indian chief, probably made by Thomas V. Brooks in the 19th century, sold for a very reasonable $13,800 at Cottone Auctions’ March 25, 2017 sale in Geneseo, N.Y. The prices for better examples continue on an upward trajectory, but it wasn’t always that way. A New York Times article from 1974 stated, “It was not until the 1950s that the general public began to realize that cigar store Indians were anything more than firewood.” The article pointed out that prices in 1974 were 10 times what they were just 20 years earlier. Nostalgia and a yearning for a simpler, earlier time simply swept the category up to the big time. One person who may own the next record-breaker is Mark Goldman, a collector and tobacconist in New York City. He began collecting in 1967 and today has over 100 life-size figures, by all the major carvers. But the one he thinks might trump them all is an early Punch figure by James “Jersey Jim” Campbell. Goldman bought it years ago when it was deaccessioned by a now-defunct U.S. Tobacco museum in Nashville. He says it’s worth about $500,000 today. 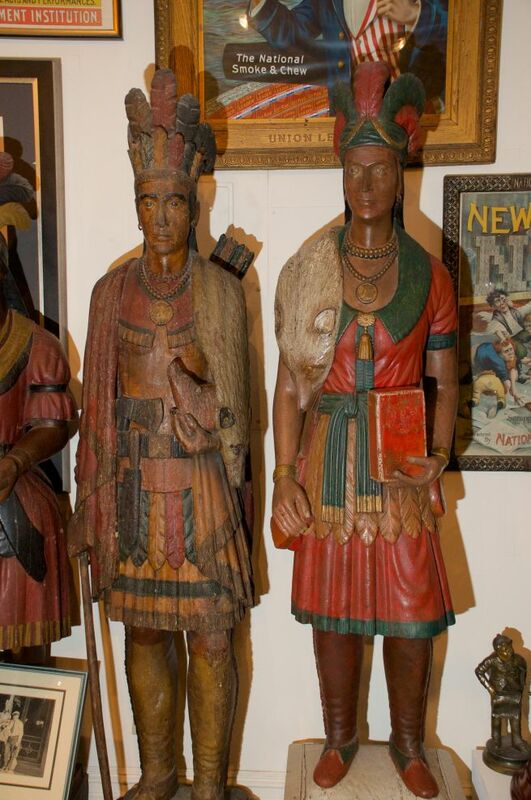 These cigar store Indians, both by Julius T. Melchers, are from the inventory of Mark Goldman, who lives in New York City and owns the largest collection of such figures in the U.S., with over 100 life-size examples, by all the famous carvers. Aside from the obvious markers like paint and condition, Goldman says he also looks for what he calls movement. “A Samuel Robb Indian with a rose, for example, or with crossed legs, or who is showing a smile instead of a stern, steady expression, might double or even triple the value of a figure that doesn’t show those things.” Goldman said whether a figure is male or female (about an equal number of each was produced) matters little. His collection is half and half. Books on the subject that collectors, or people considering collecting, refer to include Artists in Wood by Frederick Fried (the title refers to what Samuel Robb gave as his occupation on his marriage certificate), Hunting Indians in a Taxi Cab by Kate Sanborn (if you can find a copy; it was written in 1911), Cigar Store Figures by Pendergast & Ware, and The Ship Carver’s Art by Ralph Sessions. By the way, and fakes and repros are out there, so caveat emptor! The value of collecting begins and ends with what’s available and in what quantities. But what if you’re not supposed to collect it at all? There actually are quite a few items that, by law, collectors are not allowed to handle, sell, pawn, trade, auction, or represent in a transaction because they are protected national treasures. What do you do if it’s a family heirloom? How can you legally convey the object outside of your own family? It pays to know which items are protected and if there are exceptions to the rules. Only 12 astronauts have landed on the moon in six manned missions from 1969 to 1972. Over the course of those moon landings, about 842 lbs. of moon rocks and moon dust were brought back to Earth. All lunar “rubble” is considered a national treasure and is owned exclusively by the United States government. It cannot be sold publicly or privately unless it came from an official artifact that was given to an astronaut after their mission ended. An example would be moon dust embedded on patches, parts of spacesuits, boots, bags, or equipment. At one time NASA insisted that all of the artifacts kept by astronauts were government property, but Public Law 112-185, signed by President Barack Obama on September 25, 2012, gave clear title to artifacts in the personal possession of Mercury, Gemini and Apollo astronauts. Go to www.collectspace.com for more insight. 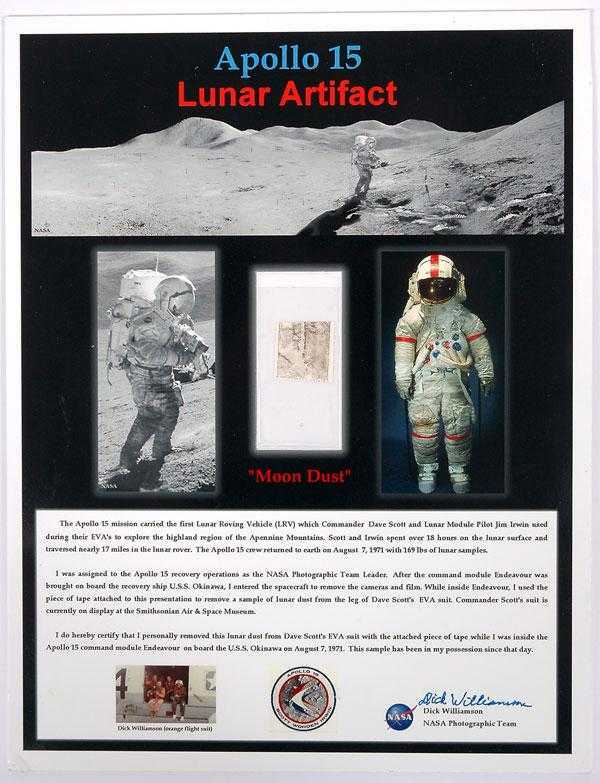 Families of astronauts may sell lunar artifacts at will, with the exception of moon rocks. They are still regarded as national treasures and held by the US government. Tragedy struck in 2003 when the Space Shuttle Columbia broke apart during re-entry, killing all seven crew members and scattering debris across a wide area in Texas, Louisiana and Arkansas. Some 2,000 debris fields were searched by a thousand or so volunteers. During the search, debris from the Columbia turned up on online auction sites, triggering a warning from NASA that some of it may be hazardous. After the September 11, 2001 attack on the World Trade Center towers in New York City, firefighters and other first responders volunteered to help with search and recovery efforts. Unfortunately, many items associated with these recovery efforts were later determined to have been looted from the site. Any piece of debris, no matter how small, from any national disaster is considered to be a national memorial, and any attempt to keep, transfer, sell, trade, or otherwise profit from it is considered theft of government property. Families with relics from national disasters, no matter how unintentional, should return the item to the proper federal authorities. The Medal of Honor is considered the oldest combat medal in the US Armed Forces. Established in 1862, the Medal of Honor is awarded by the president of the United States in the name of Congress for “… conspicuous gallantry and intrepidity at the risk of life above and beyond the call of duty,” per 18 USC 704. Since 1862, Congress has awarded 3,520 Medals of Honor. 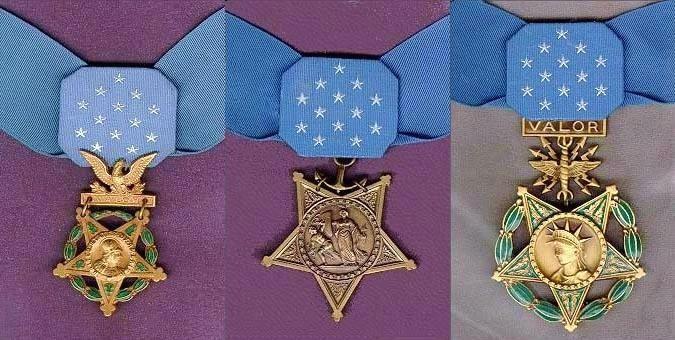 There are three different versions of the modern Medal of Honor, each specific to the Army, Navy and Air Force. However, US Code prohibits “purchasing, attempting to purchase, soliciting for purchase, mailing, shipping, importing, exporting, producing blank certificates of receipt for, manufacturing, selling, attempting to sell, advertising for sale, trading, bartering, or exchanging for anything of value” a Medal of Honor. So, if your family has one, what should you do with it? Keep it as a family heirloom. If it is necessary to remove it from the family, the medal should be returned to the Department of Defense. The Oscar awarded in 1947 to the pioneer of the movie projector, Thomas Armat. It pre-dates the 1950 regulation that would have required its first being offered to AMPAS for $1. 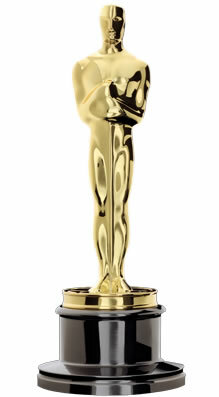 The Oscar sold legally for $80,000. Image courtesy of LiveAuctioneers and Heritage Auctions. “…and the Oscar goes to…” is the phrase every actor, director, producer or other motion picture professional hopes will be followed by the sweet sound of their own name. The winner’s ritual goes like this: stand, look surprised, look humble while enjoying the lavish applause, and deliver a witty speech while clutching the gold-tone statuette you just received. If you’re lucky enough to be the recipient of this most coveted of all film awards, you learn sooner or later that there’s just one small problem: the Oscar isn’t really yours. It is essentially leased to you by the Academy of Motion Picture Arts and Sciences (AMPAS). From 1929 until 1950, an Oscar belonged to the recipient, and they could do whatever they pleased with it. They, and their families, were allowed to sell them, if they wished to do so. After 1950, however, the Academy had each award encumbered, meaning that if the recipient wanted to sell it, they had to first offer it to the Academy for $1. It was a gold coin that really wasn’t. To help ease the banking crisis of 1933, President Franklin D. Roosevelt ordered that gold was no longer legal tender. All gold pieces, certificates or bullion in circulation were supposed to be turned into the federal government in exchange for currency. 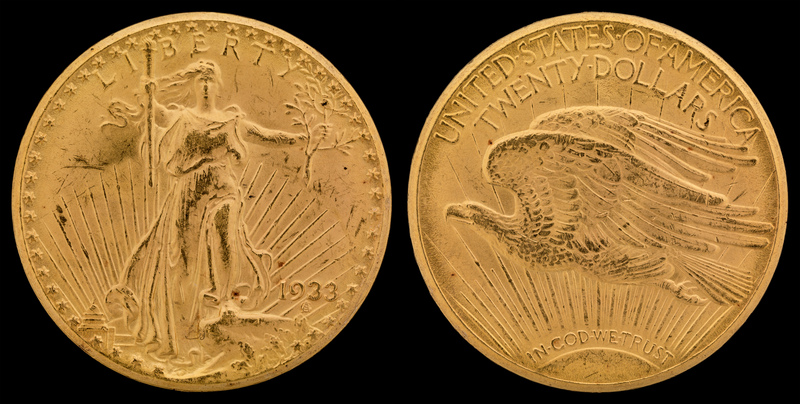 As of the time of Roosevelt’s decree, 445,500 $20 gold pieces had been minted for the year 1933. All but two were subsequently melted down. However, about 20 were stolen from the US Mint, with about 13 remaining at large. By the early 1940s, between eight and 10 specimens were known. Two of them were sold by Texas dealer B. Max Mehl. 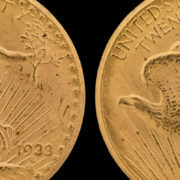 In 1944, a journalist enquired of the Mint regarding the 1933 double eagles. Mint officials could find no record of any issuance of the coins, and decided those in private hands must have been obtained illegally. Over the next few years, the Secret Service seized a number of specimens, which were subsequently melted. One piece, however, wound up in the hands of King Farouk of Egypt, who even obtained a U.S. export license for the coin. What became of the Farouk specimen after his death is unclear, but the coin resurfaced in the late 1990s. When brought to New York for sale to a prospective buyer, it was seized by U.S. authorities. After litigation, a compromise was reached to allow the coin to be auctioned, with the proceeds to be divided equally between the government and the private owners. In 2002 this coin sold at auction by Sotheby’s for $7,590,020. The purchase price included $20 paid to the federal government to monetize a coin it contended had never been officially released. 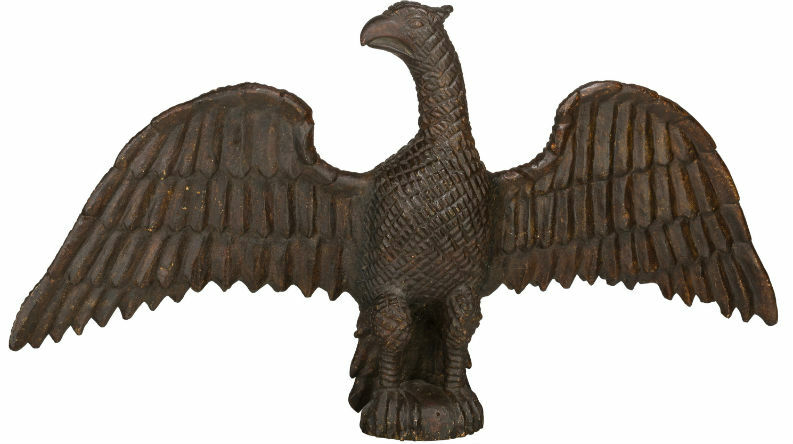 In 2004, 10 specimens of the 1933 double eagle were submitted to the Mint for authentication by the heirs of a Philadelphia jeweler who may have been involved in obtaining them from the Mint in 1933. The Mint authenticated them but refused to give them back. The heirs brought suit against the government in 2006, and a federal judge ordered the government to file a forfeiture action regarding the coins. The government brought such a suit in 2009, and it was tried in the United States District Court for the Eastern District of Pennsylvania beginning on July 7, 2011. On July 21, 2011, a jury decided that the coins had been properly seized by the Federal government. Judge Legrome D. Davis confirmed that jury verdict on August 29, 2012. On April 17, 2015, a panel of the United States Court of Appeals for the Third Circuit ruled that the government had failed to file its forfeiture action in a timely manner, and that the heirs were entitled to the coins. That ruling was vacated by the full court on July 28, 2015, and the case was set for further argument. On August 1, 2016, the full Third Circuit ruled in favor of the government, upholding the jury verdict. On November 4 of that year, the heirs asked the Supreme Court to review the case. The request was refused on April 21, 2017, thus ending the case. It has been legal to own gold again since 1975, however the stolen $20 gold coins are still regarded as contraband and are subject to confiscation, fines and imprisonment. However, to Native Americans, eagle feathers are sometimes used in religious ceremonies. This is why the National Eagle Repository was established by the US Fish and Wildlife Service. The agency issues permits to members of federally recognized tribes allowing them to possess eagle feathers for such ceremonies. Families with eagle feathers or eagle parts should deposit them in the National Eagle Repository for proper distribution. Between the peace-and-love Woodstock decade and the era of Atari, Apple and Star Wars that followed, America had the real-life version of That Seventies Show going on. 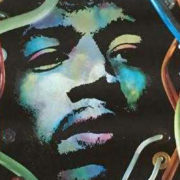 If you remember tie-dye shirts, Starsky & Hutch, or any car with a vinyl top, you were there. If not, you can relive the colorful 1970s with a playroom decked out with posters, toys and other fun collectibles available in Jasper52’s Sept. 11 online-only auction. It’s no secret that fakes, frauds and forgeries have infiltrated virtually every corner of the antiques and collectibles market. Counterfeiters have tried to replicate everything from rare coins to Confederate belt buckles in hopes of passing them off as items of great value. And some fakes are very, very good – good enough to fool even prestigious art museums with world-class experts on staff to vet their acquisitions. Until the 1970s and ’80s, the field of petroliana was pretty much immune to this sort of nefarious activity. 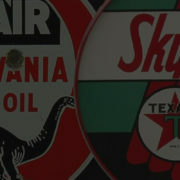 It was a sleepy sub-genre of vintage collectibles, supported mainly by classic car and gas station enthusiasts. Almost nothing in the field carried great monetary value. Signs, oil cans, gas globes and pumps were pretty cheap to come by. But starting in the 1970s, and certainly in the ’80s and ’90s, everything changed as the category got more organized and the nostalgia craze took hold. It was a wake-up call not just to him, but also to the industry as a whole. He and a colleague, longtime petroliana insider Scott Benjamin, began to write books to enlighten collectors to the dangers of buying a worthless knock-off advertised as the real McCoy. They pretty much succeeded in cleaning up the fake gas globe and gas pump trade. Oilcans, too, have been faked, but they’re difficult and labor-intensive to produce, so they’ve never been a real factor. “I’ve seen decanter-style phony cans that wouldn’t fool a two-year-old,” Henderson remarked. “Some others have been cleverly made and can reach prices approaching five digits, but I think the payoff just isn’t worth the time and effort.” So, with cans, globes and pumps largely under control, that left just one problem area: signs. Face it, when a single Musgo, Harbor or Clipper sign can bring $50,000 or more at auction, it’s no surprise that people will be out there trying to fake them and pass them off as genuine. To be clear, most reproductions are clearly marked as such and are not meant to deceive the public. But the problem of fakes is so prevalent that a new company has sprung up to combat it. It’s called The Authentication Company (or TAC) and was co-founded by Dan Matthews, a petroliana auctioneer and expert who’s authored several books on the subject; and Joey Whiteside, a lifelong petroliana collector who specializes in advertising signs. The firm is headquartered in Nokomis, Illinois, and is online at www.MatthewsTAC.com. •	Size and style. Was the size or style of sign ever even made? (remarkably, oftentimes it wasn’t). If, for example, a size was only made in a 30-inch and a 40-inch size and you see one that’s 24 inches in diameter, run the other way. •	Quality. Look at the sign for its overall quality of workmanship. Does it look and feel real? Original signs have crisp, clear lines and edges on all letters and graphics, and were made with porcelain covering all sides. If a sign is missing enamel on the sides or inside the grommet holes, it’s probably a reproduction. The enamel inside the grommet holes can get chipped away, but there’s usually some evidence of its prior existence. •	Stamps. Pay close attention to the stamps printed on a sign. These will often tell the date a sign was made, or the company that created it. For example, reproduction Mobil signs are supposed to be marked with the words, “Licensed by Mobil Corporation,” but a huckster may try to knock off the finish where the distinguishing words are located. •	Holes. Are the holes in the right places? Some signs look very close to the originals, but the holes that were meant to be used in hanging the signs don’t appear in the right places. •	Grommets. Does the sign have grommets in the mounting holes? Almost all original signs had them at one time or another. If the sign doesn’t have grommets, there should be some chipping in the holes since they were most likely there at one time. •	Color. Are the colors and/or sign design accurate? Compare the sign to others that you know to be legitimate. If the color of the sign is a little off, this is a red flag. It’s not a mistake that would have been made by the factory. On original signs, the paint color will always be consistent. •	Feel. Does the back of the sign feel like sandpaper? The backs of most porcelain signs are smooth, or have some texture, but if the back is rough, it’s probably a fake. There are exceptions. The porcelain on the back of an original sign is usually not as thick as the front, so that’s almost always the first place it will rust. Also, if a sign has been buried in the ground for a while to artificially render the effect of “ageing,” the back will start to rust, which can make it feel like sandpaper. •	Design. 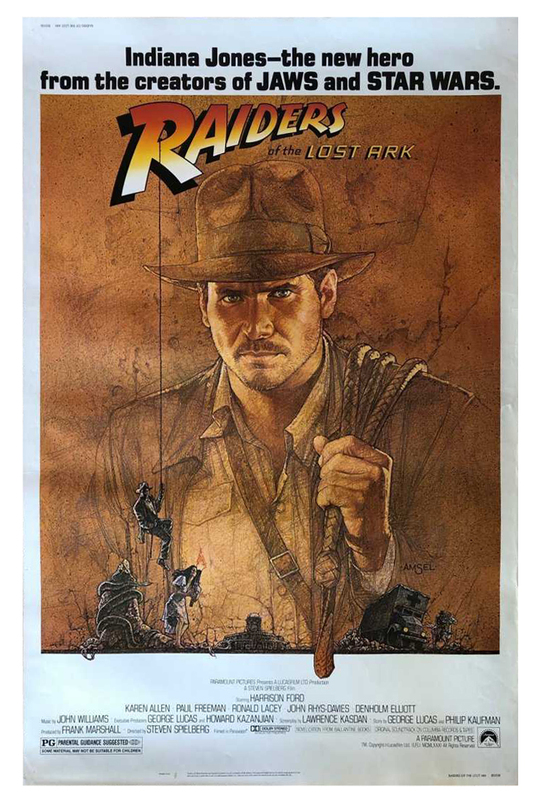 Many repros are “fantasy” pieces – signs that are appealing to the eye but were never created that way. The fabricators take the logo and colors of a company and invent a new, eye-catching piece they think people will want to buy. This is fine, so long as the sign is clearly marketed as a reproduction and not an original. Unfortunately, some people (new collectors, especially) are dazzled by what they see, believe it to be original, and as a result, overpay for it. Matthews and Henderson both agree that best way to protect oneself against being knowingly or even unknowingly sold a fake sign is through self-education. They strongly urge newbies and even seasoned petroliana collectors to read guidebooks, join clubs, talk to people who are knowledgeable in the field and – most importantly – always buy from reputable auction companies or dealers who are familiar with the items they’re selling. 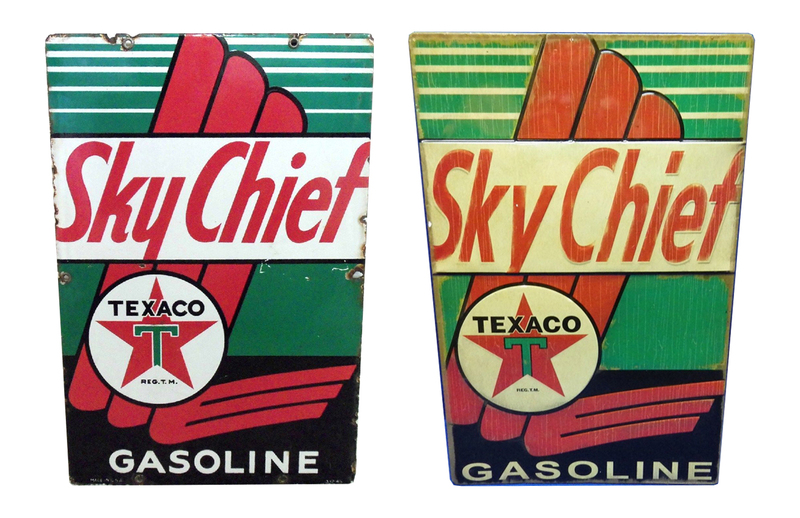 Both the 8-inch Texaco sign at left with a white-outlined T and the 15-inch Texaco sign at right with a black-outlined T are authentic. 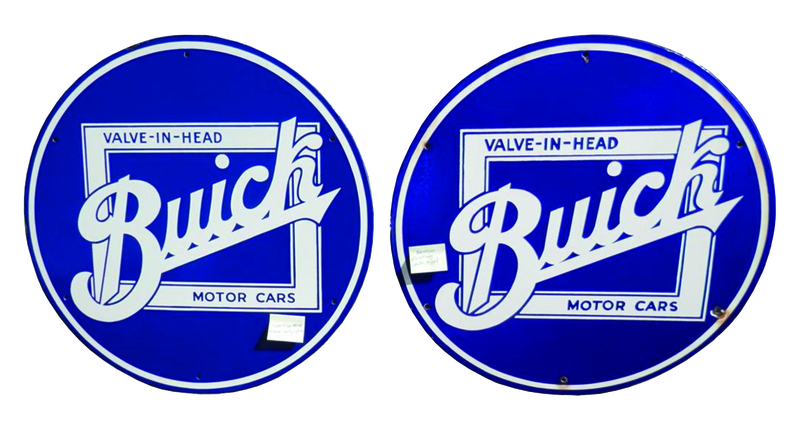 The heavily pitted 12-inch sign shown at right is a phony that was aged to deceive the unsuspecting. Errors include an incorrect typeface for the word Texaco, computer typeface oversized registration text, and a fake date. Images courtesy Petroleum Collectors Monthly.